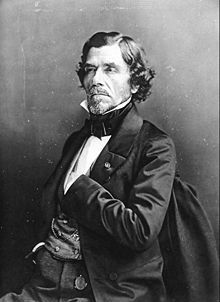 Eugène Delacroix? Yes! This is my "E" post for Blogging Through the Alphabet with Ben and Me! His full name is Ferdinand Victor Eugène Delacroix, and he was a French Romantic artist born April of 1798. He looks pretty serious and a little severe here, don't you think? The warmth and vitality you find in his paintings are definitely not reflected here in this photograph of him. I think this self-portrait is much more friendly. If you are a follower of Ambleside Online's art schedule, you may already be familiar with him as he was the Term 3 artist for last year's schedule, but I skipped him. His paintings are interesting to me because he painted many scenes from the Middle East and that is pretty unusual for this time period. 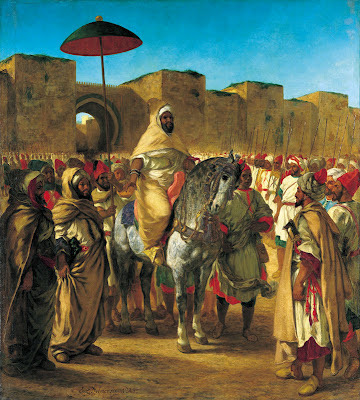 "The Greeks and Romans are here at my door, in the Arabs who wrap themselves in a white blanket and look like Cato or Brutus…"
Here is his Sultan of Morocco. Pay attention to the eyes. I love them. The horse matches the master! 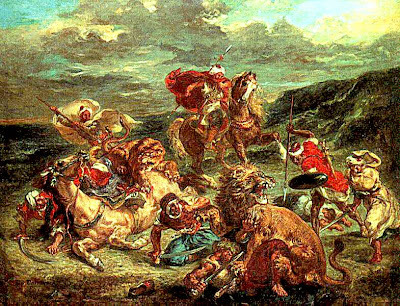 There are many versions of the painting below entitle, The Lion Hunt, as he must have had a fascination for it. I like the colors and the movement in this one. Even the trees seem to be moving with the violence of the hunters. Here is a second one that I like less, but it has a lot of similarities. There is still a great deal of mayhem going on in this one! The people are less clear and the sky is prominent in the background. Which one do you like best? Arab Horses Fighting in a Stable is a beautiful representation of two strong horses and what happens when their strength becomes dangerous for the human "controlling" them. I love the look of the horses here--their majesty is fully displayed. What do you think of it? 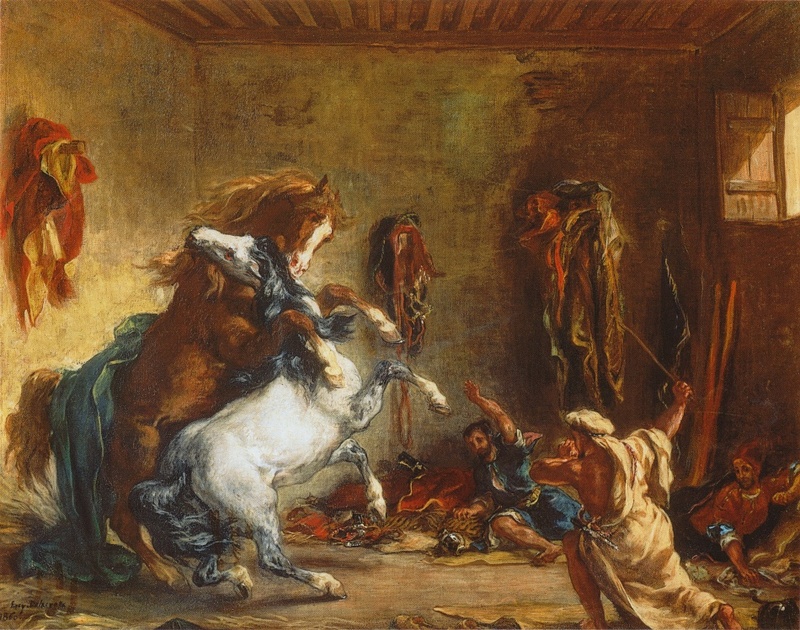 For you Shakespeare fans, Delacroix painted some of his works too. This is one I particularly like. It is called Hamlet with Horatio, (the gravedigger scene). I am partial to the sky in paintings (and in real life--I love the clouds). Sky scenes are often so telling. Backgrounds of painting are fascinating to me too as sometimes artists put much of themselves into the background. It is worth noting. Here I veer from showcasing his wilder works, and share a few of his softer lovelier works. 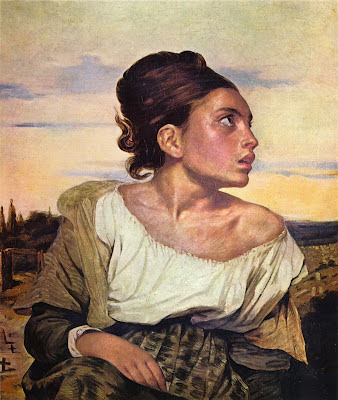 This is so different from the other paintings that is doesn't seem that it could be painted by Delacroix. This is called A Vase of Flowers on a Console. I love the lush background here with the fabric and gold frame on the right. It is obviously from a very wealthy home as flowers like this would have cost quite a bit! I love the flowers though and think they are just lovely. His use of light is beautiful here. I really like this last one. It is called Orphan Girl at the Cemetery. Not only did he paint, but he also illustrated several books. 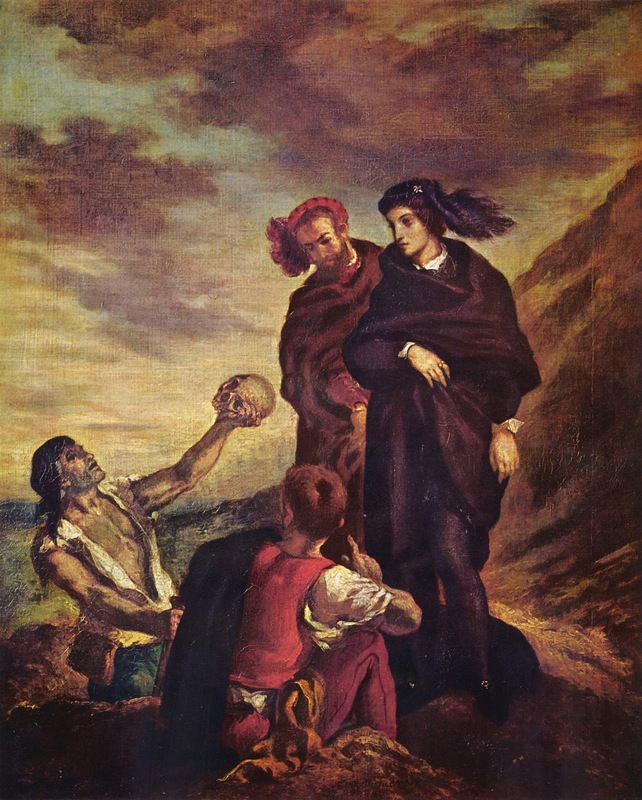 Sir Walter Scott, Shakespeare, and Goethe are among them. Here are some of his lithographs. This last bit of information was too good to leave out. As I was looking at his artwork I could not miss the way some of it felt a little Impressionistic to me. Now I understand why. He was a forerunner and set the stage for them. I found the following here. In the history of art Delacroix is relevant because of the example he set for the impressionists. He used a rough but swinging brushstroke, experimented with colours and light and sometimes neglected proper use of perspective: all typical elements of the impressionist style. Some see him as the link between the classic style of the old masters and the modern movements that arose in the 19th century. 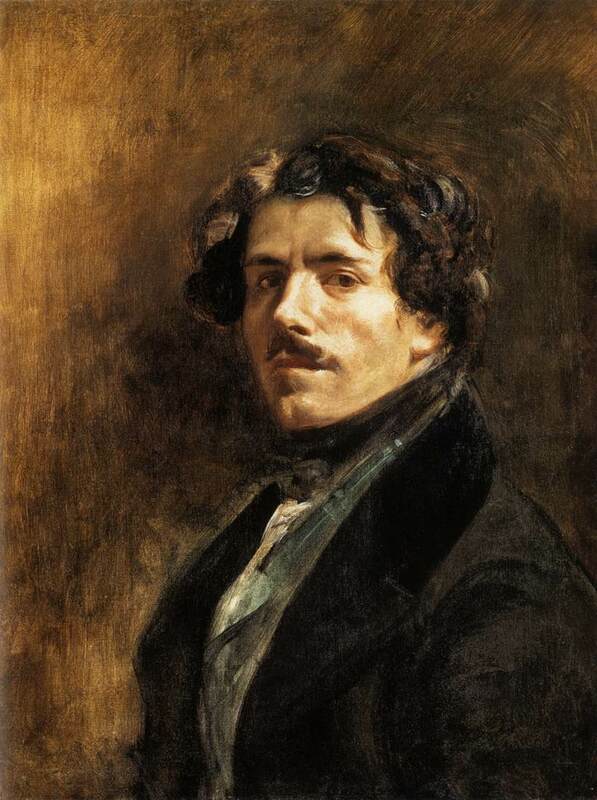 Eugène Delacroix died in 1863 and was buried at Père Lachaise cemetery in Paris. He created over 850 oil paintings and more than 2000 drawings and watercolours. Among his works were many with a religious subject, tempting some to consider this worldly Parisian the most important religious artist of the 19th century. May God be the center of your week. These were beautiful. I loved his display of motion, from the fabric rippling and trees swaying...he really captured the mystery of the east. I also liked his use of light in the Vase of Flowers. But my favorite is the Orphan Girl. You just want to stare at that painting, wanting to know about her, and what she is looking at. Thanks for sharing this, Kate! Wow! I had never heard of him. I bookmarked the Art Schedule a while back after you linked to it but have never made an effort to implement it. I really need to do that. Very interesting! 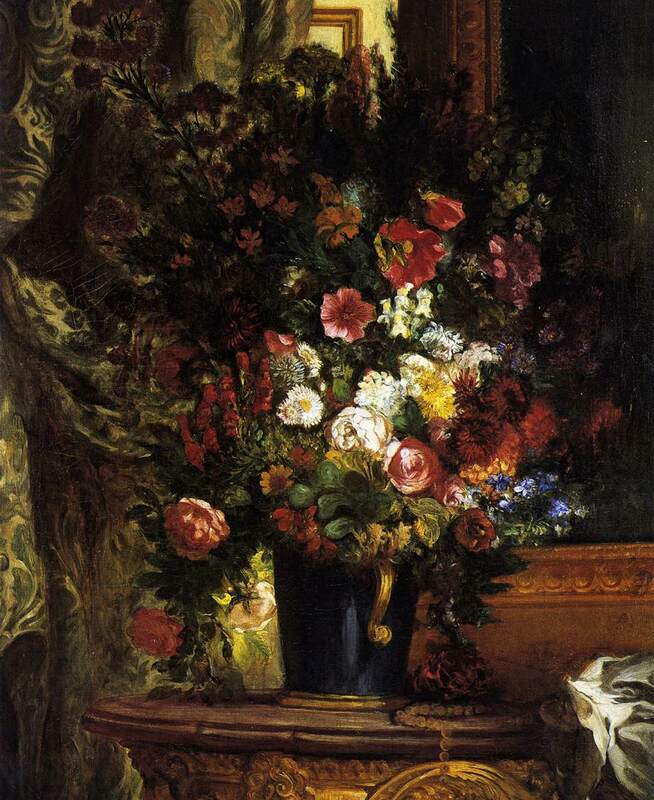 I especially like the Vase of Flowers, which is not usually the type of painting I'd be drawn to. It's fascinating to imagine the stories behind some of the unknown subjects like the Orphan Girl.